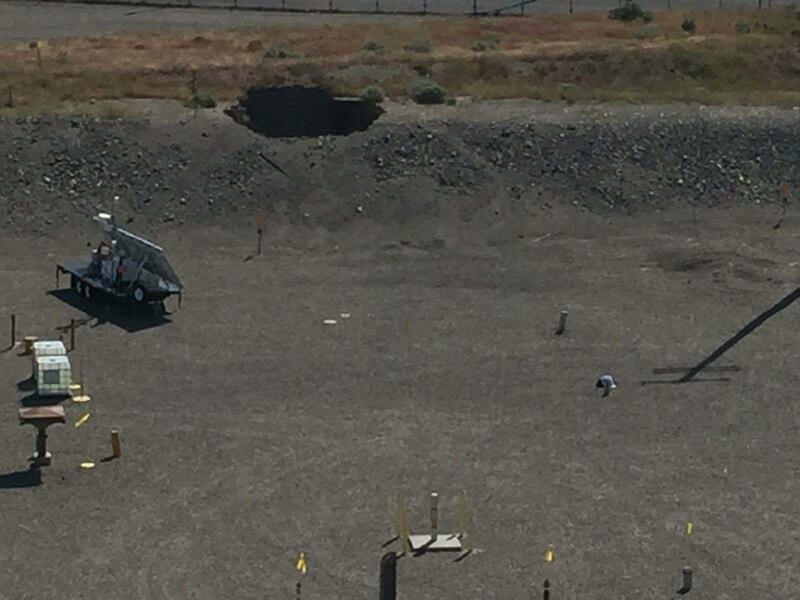 SPOKANE, Wash. -- An emergency was declared Tuesday at the Hanford Nuclear Reservation in southeastern Washington after a portion of a tunnel that contains rail cars full of nuclear waste collapsed. The alert, which was later expanded to a site area emergency, was activated shortly before 8:30 a.m. at the Hanford Emergency Operations Center, according to the U.S. Department of Energy (DOE). The accident occurred at the Plutonium Uranium Extraction Facility (PUREX), located in the middle of the sprawling Hanford site, which is half the size of Rhode Island. The closed PUREX plant was part of the nation's nuclear weapons production complex. Authorities say the collapse took place within one of two rail tunnels under the PUREX site, which contains contaminated materials. One tunnel is about 360 feet long, and the other spans approximately 1,700 feet. The partial collapse, which covered about 400 square feet, took place in an area where the two tunnels join together. The incident caused the soil above the tunnel to sink between 2 and 4 feet. The discovery of subsided soil was made during routine surveillance of a 20-foot area in the tunnel. No workers were inside the tunnel when it collapsed, but nearby crews were evacuated as a precaution. Some employees were asked to secure ventilation and shelter indoors while others were sent home early. The entrance to the site has been restricted. "This is a serious situation," Washington Gov. Jay Inslee said in a written statement. "Ensuring the safety of the workers and the community is the top priority." Crews are currently surveying the area near the PUREX tunnels for contamination. At this time, no radiation has been detected. According to the DOE, the collapse may have been caused by road crews doing construction above the tunnel location. The level of concern for significant danger at the site has subsided. "Federal, state and local officials are coordinating closely on the response," Inslee continued. "We will continue to monitor this situation and assist the federal government in its response." The federal government created Hanford at the height of World War II as part of a hush-hush project to build the atomic bomb. The site produced plutonium for the world's first atomic blast and for one of two atomic bombs dropped on Japan. It continued production through the Cold War. In 2006, "60 Minutes" covered the mind-boggling mistakes made at the site, like the decision to build a pretreatment facility for radioactive waste that wasn't designed to withstand an earthquake. Today, it is the nation's most contaminated nuclear site, with cleanup expected to last decades. It contains about 56 million gallons of radioactive waste, most of it in 177 underground tanks. The latest estimate to finish the overall cleanup is more than $107 billion. The work would take until 2060. The Energy Department in recent years has spent about $2 billion a year on cleanup work. Hanford, which has more than 9,000 employees, is located near Richland, about 200 miles southeast of Seattle.